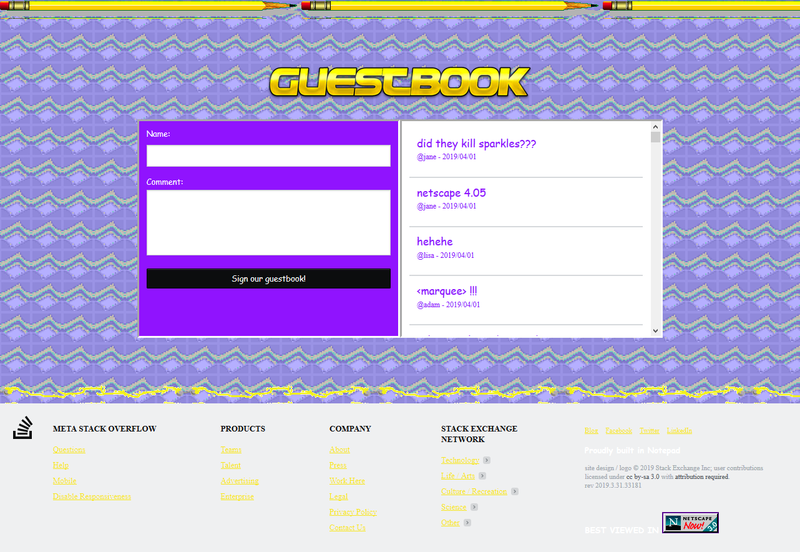 The site now has a '90s "Geocities" feel, complete with unicorns, sparkle trails, gaudy backgrounds, and <marquee> tags. This is happening to me on Google Chrome. I have never installed any plugins or user extensions. I believe this is coming from Stack Overflow. Am I the only one seeing this? What is causing this to happen? Did the site get hacked or something? It's clearly an April Fools' Day prank, as is tradition on Stack Overflow. The Stack Exchange network follows UTC time, and it is already April 1, 2019 in some areas of the world. 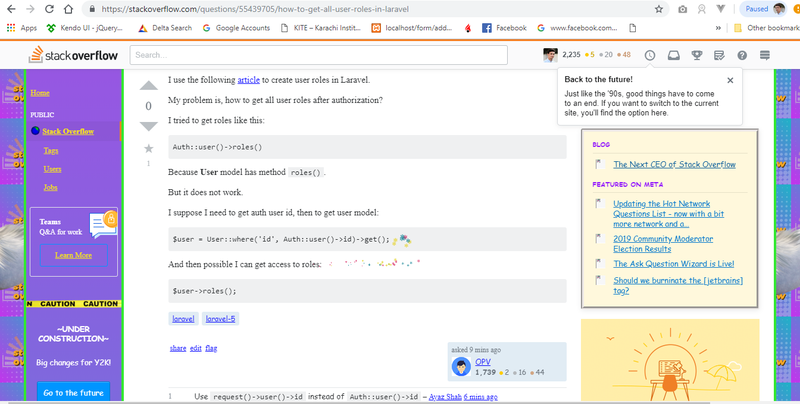 I would like to congratulate Stack Overflow, they did a fantastic job of re-creating the '90s. I guess they may not have considered that many current SO users don't actually know what the internet looked like in the 90s? In any case, the marquee at the top, the Comic Sans text, the lime green borders, the tiled background, cursor trailers - marvelous stuff!! I have to admit that you suckered me with the new theme for approximately 2.578 seconds - I had just visited a meta question of mine regarding a tag that had officially been burninated and I thought the theme was a celebration of that. Then I checked the time and realised it wasn't all about my question at all. Edit: OMG there's even a guest book!! ROFLMAO!! As the website indicates at the bottom right corner, it is "BEST VIEWED IN Netscape 3.0". Not sure why it is not showing the W3C compliant banners, but if you setup Netscape 3.0 it should fix it all. If you cannot find Netscape 3.0 (a more recent version will not work), you can conveniently click the little clock at the top right corner in order to instantly setup Netscape 3.0. Oh! That was supposed to be comic sans! I’m both sad and happy I don’t see it that way on my iPhone. Sad because I don’t get the full retro experience. Happy because now I know my phone is clever enough to replace comic sans with something not entirely as atrocious. ...which unfortunately cannot be permanently disabled right now in Chrome as it seems. Not the answer you're looking for? Browse other questions tagged support april-fools time-machine . How to stop the 90’s look of the Stack Overflow? Why were icons not in Time Travel? 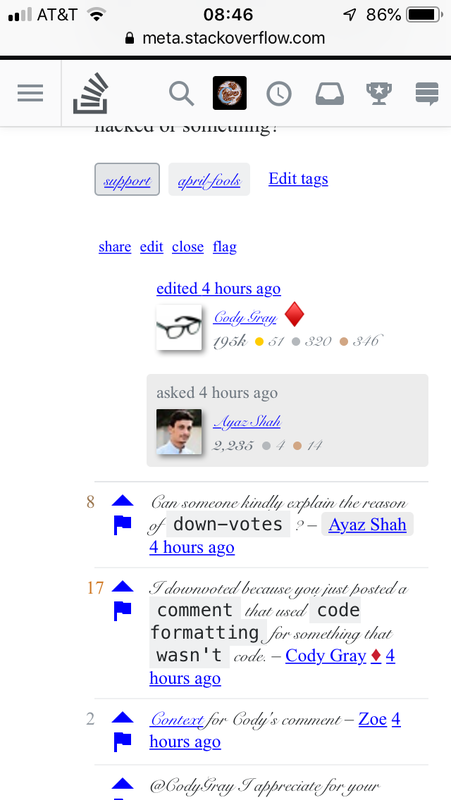 I thought only moderators could close questions with one vote. Has this changed recently?